Do you want to defeat FOMO once and for all? Fomo, or the fear of missing out, might be one of the trendier expressions on social media, but the phenomenon is not new. It’s probably been around as long as humans. I imagine the caveman, upon hearing his neighbor grunt and head out with a club to hunt, grabbing his own club and following for fear of missing out. In biblical times they called it “coveting.” More recently, we call it “keeping up with the Joneses”—the longing not only for the material things your neighbors own but to do whatever seemingly pleasurable or fashionable thing they are doing. FOMO is all of those things on steroids. When I was a kid, I used to look across the street and imagine the wonderful things the rich kid’s family in my neighborhood was doing. But now we don’t have to imagine; we can see it all in real time on social media. FOMO can strike every time a neighbor or friend posts pictures of their amazing vacation, the really cool birthday party they had (to which I wasn’t invited), the awesome laces they eat, and the conversations they have with all the cool people they interact with on Facebook, Instagram, and Twitter. If I’m not reasonably secure and happy myself, looking at all those posts with their pics of the happiness, bliss, and just plain awesomeness of everyone else’s life can make me anxious, insecure, and unhappy. FOMO was first named in The Harbus—the Harvard Business School’s independent newspaper—on May 10, 2004. The author of the piece, HBS student Patrick McGinnis, actually named two related conditions. One was FOMO. The other was FOBO, or fear of a better offer. McGinnis offered his acronyms tongue in cheek, but I suspect you’ve felt the very real pang of both at some point. In McGinnis’s story, FOMO led one presumably fictional Harvard student to schedule a night of multiple meet-ups with different friends for drinks every fifty minutes or so until the wee hours of the morning. No way was he going to miss out on the fun anyone else was having, and his neurotic evening plans proved it. The story might have been satirical, but the phenomenon is very real. Social media helped to promote FOMO from a term in an obscure satirical article in a Harvard paper to a clinical state of anxiety most people under thirty are familiar with and feel they have suffered from at some point. The great thing about social media is the way it keeps you connected with people with whom you might not otherwise remain in contact. You can follow them, peering into the best moments of their lives. And they can do the same with you. But all of this can come at a price to your mental health. I remember hearing a conversation a few years ago on National Public Radio with several teenage girls. They were reporting on their use of social media and the feelings they had when they posted something and only a few people responded. They described the feelings of rejection when they had fewer friends than others or if someone unfriended them or refused to accept their friend request, and how they felt when they saw that a friend was doing something without including them. Social media has become the perfect machine for producing anxiety. If you’ve felt yourself afflicted by social media–induced anxiety, it’s good to remember a few basic things about posts— things you likely already know but sometimes forget. I think my own posting habits are pretty typical of what most of us do on social media, and I’ve noticed that certain unstated “rules” apply, or should. When I post a photo online, it is never of my wife and me fighting, or when I’m not feeling good, or when my life is just ordinary and boring. I also avoid posting pictures that make me look fatter or older than I really am. I’ve been known to crop a picture a bit before posting just because the original seems to add twenty pounds or accentuates the crow’s feet around my eyes. What does this mean? It means that if you see my pictures on Facebook, Twitter, or Instagram* you should know that you are seeing only my best, happiest moments and these do not reflect my entire life, just the particularly good times. A second way to address FOMO is to take a break from social media, or at least ratchet down your use. For many people, social media is an addiction—our brains crave it the moment we get up in the morning, and we need it again on each break at work. We look at it while we’re shopping, eating, with other friends, even in the bathroom. And then, just before we go to bed, we check it once more, going to sleep with images in our mind of the awesome life everyone else is living! If FOMO has you down, try taking a break for a week, a month, or maybe even a year. I’ve met a surprising number of people who are doing just that. When we’re constantly on social media and looking at what other people are doing in their lives, we fail to live in the moment in the life we’re actually living. Reprinted (or Adapted) from UNAFRAID: LIVING WITH COURAGE AND HOPE IN UNCERTAIN TIMES © 2018 by Adam Hamilton. Published by Convergent, an imprint of the Crown Publishing Group, a division of Penguin Random House LLC. Adam J. Hamilton, a leading voice for reconciliation and church renewal in mainstream Christianity, is the senior pastor of the 20,000-member Church of the Resurrection, Kansas City, the largest and most influential United Methodist congregation in the United States. He is the author of twenty-five books. 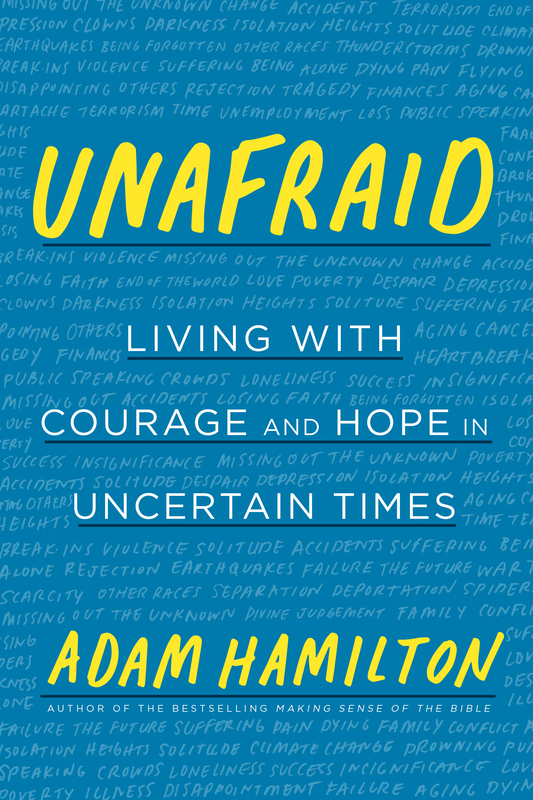 His new book, Unafraid: Living with Courage and Hope in Uncertain Times, is on sale March 13, 2018. How Do You Overcome Random Feeling of ‘Fear of Missing Out’? Has FOMO Got You Down?